To Cite: Tehrani H, Majlessi F, Shojaeizadeh D, Sadeghi R, Hasani Kabootarkhani M. Applying Socioecological Model to Improve Women’s Physical Activity: A Randomized Control Trial, Iran Red Crescent Med J. 2016 ; 18(3):e59253. doi: 10.5812/ircmj.21072. Background: A sedentary life without sufficient physical activity is recognized as a risk factor for various diseases, and a major modifiable risk factor for noncommunicable diseases. This study was conducted to investigate the effect of intervention using socioecological model in promoting women’s physical activity in the city of Kerman, Iran. Materials and Methods: In this randomized, double-blinded, controlled study, 360 women were studied at health and medical centers of Kerman. This educational intervention was based on socioecological model and conducted on 4 levels of personal, social, organizational, and political. Data collection tool included a researcher-made questionnaire based on constructs of socioecological model and the international physical activity inventory. Results: The results indicated insignificant differences between the two groups in terms of perceived social, physical, and political support and also with regard to level of physical activity before intervention. However after the intervention and according to independent t test, significant differences were observed between two groups in perceived social, physical, and political support and also level of physical activity (P < 0.001). Furthermore, mean values of the above terms increased in the intervention group. Conclusions: According to the results, interventions based on socioecological model can positively affect women’s physical activity. Copyright © 2016, Iranian Red Crescent Medical Journal.This is an open-access article distributed under the terms of the Creative Commons Attribution-NonCommercial 4.0 International License (http://creativecommons.org/licenses/by-nc/4.0/) which permits copy and redistribute the material just in noncommercial usages, provided the original work is properly cited. Due to various reasons, people are nowadays increasingly heading toward sedentary and inactive lifestyles. Technological advances have caused many tasks that used to be physically performed, to be carried out by machines (1). Long working hours and induced stresses which lead to lack of time and patience to perform physical activities are also implicated for people’s lower mobility. Spread of urbanization and life in cities also attribute to reduced physical activity, due to distancing from nature (2). According to the World Health Organization, annually, 1.9 deaths occur worldwide due to insufficient physical activity. Furthermore, lack of physical activity is one of the risk factors of chronic ailments such as cardiovascular diseases, colon cancer, diabetes, obesity, osteoporosis, hypertension, and psychological disorders (3). Research has shown that regular physical activity would reduce the risk of these diseases. It also lowers the risk of stroke, helps control weight, and is essential for healthy bones and muscles (4). To fight inactivity and perform suitable physical activities, behavior change and health promotion programs are to be considered. Health behavior change educational programs are effective when their contents are suitable for the target population and intended health behavior (5). Studies have shown that the most effective educational programs are theory-based programs, rooted in behavior change models (6). Accordingly, in studies that researchers seek to raise awareness, change attitude, and improve behaviors of participants, it is necessary to assess views and behavior change models, and select an approved method (7). However, the choice depends on the type of behavior studied. As stated earlier, physical activity as a priority and its promotion is significantly dependent on the participation and involvement of various sectors. Thus, with respect to this health issue, application of interpersonal and collective theories such as socioecological model is appropriate (8). Socioecological model (SEM) is rooted in ecological theory that was proposed in 1970 by American psychologist, Urie Bronfenbrenner. Ecological theory argues that human development is affected by a set of mutual interactions that may support or undermine it (9). SEM provides a framework for evaluating numerous and mutual effects of social elements (10). This model integrates various levels that affect health to show a clear and full picture of factors influencing health. 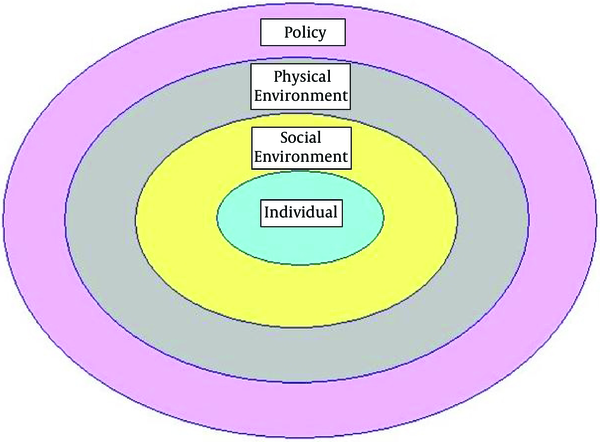 These factors include individual, interpersonal, social environment, physical environment, and public policies (Figure 1). In this model, factors affecting behavior are shown as layers, and each layer is influential to reach the next level; individual’s change of behavior is also affected by every layer (11). Individual level is at the center of the model and includes personal characteristics such as age, gender, knowledge, and attitude, which leads to an increase or decrease in likelihood of conducting a behavior. Strategies that cause change of behavior are focused on the individual’s awareness, attitude, skills, and abilities (12). Social environment includes culture and interpersonal interactions, and has a considerable effect on performing behavior of physical activity. For example, having a physically active classmate, colleague, or a family member can affect performing behavior by the individual (13, 14). Physical activity is performed in a physical environment, and includes natural or man-made environments. At this level, physical environment includes availability and access to welfare facilities such as parks, play grounds, sports facilities and gyms (15). Political environment refers to rules, regulations, and policies that can affect physical activity (11). Given that most educational programs in the field of physical activity have had an old and traditional approach, there has been little application of educational interventions based on behavior change models, particularly socioecological model. This study attempts to investigate the efficacy of theory-based educational interventions according to socioecological model. This study was conducted to investigate the effect of intervention using socioecological model in promoting women’s physical activity. In this intervention, study population consisted of women attending medical centers in Kerman, Iran. Of 8 health centers in Kerman, 4 were randomly chosen as intervention centers and 4 as control. Considering type 1 error of 0.05 and power of 80%, also assuming 15% score difference between before and after intervention, sample size was estimated at 180 persons, and given the same number for control group, the total sample size was found 360. Inclusion criteria were as follows: being over 18 years old, having mobile phones and the ability to use it, ability to use computers and the Internet, and willing to participate in the study. Inability to exercise and suffering from a debilitating condition were the exclusion criteria. Data collection tools included international physical activity questionnaire (IPAQ) and a researcher-made questionnaire based on socioecological model, which assessed personal status, social support, physical support and political support. Regarding the personal status, the level of awareness and attitudes towards physical activity were studied. As regards the social support, the level of perceived social support from family, friends and so on were evaluated. With respect to the physical support, familiarity with the existing sports facilities and information for women in the city were examined. Finally, as regards the political support, the familiarity with the existing rules in the field of physical activity was assessed. IPAQ estimated women’s physical activity rate in the previous week in terms of the metabolic equivalent of task (MET)-minutes/week (16). After development of the questionnaire, its face and content validity were assessed; also it was edited through review of the literature and using views of experts on the subject. Once face validity was confirmed using content validity index (CVI) and content validity ratio (CVR), the questionnaire was sent to 10 experts and their views were implemented to resolve any potential deficiencies. To determine reliability of the questionnaire, test-retest and Cronbach α were used, so that the questionnaire was completed by 20 women at health centers in Kerman, and 2 weeks later they completed the questionnaire again. The Cronbach α for internal consistency of the questionnaire was between 82% and 88%, and intra-class correlation coefficient was 71% to 77%. Data collection in the first stage (pretest) was simultaneously performed in all 8 health centers. After pretest, the case group underwent educational intervention, based on socioecological model. To assess efficacy of intervention, 3 months later, data were again collected using the same tools. Then, descriptive and analytical statistical tests such as Chi-square, independent and paired t tests were conducted to determine variable distribution differences between women in case group (trained) and control (nontrained) using SPSS-20 software. With collection of initial data and analysis of pretest stage findings, educational framework based on constructs of socioecological model was determined. According to the model, intervention was made on attitude and awareness of participants at individual level, using educational multimedia. To that end, a classified auto-run educational CD was prepared in accordance with the latest headings on physical activity by the Ministry of Health and Medical Education, and issued to women in the case group. At social level, a modern social media, based on the Internet, such as website was used. To this end, an educational website was designed for women’s physical activity (www.vc.salem.ir) with various sections. On this site, in addition to various physical activity trainings and benefits of regular exercise, a section was devised for educational video where women were able to watch videos and also download them for offline use on their mobile phones. Moreover, the site contained an electronic section to enable women to evaluate their physical activity, body mass index (BMI), and diets online. In fact, through self-evaluation, they were encouraged to perform their physical activities. At physical level, web-based social networks were used. Two sections were considered, one was a chat-room, where women could exchange views and personal experiences in relation to physical activity, and the second, where appropriate facilities for women’s exercise and physical activity such as women-only parks, and the like were introduced with photos and details of the facility. At political level, with coordination of some managers, an SMS panel was procured, and text message used for intervention. Receive authorization to send an SMS carried out to the political interventions. To that end, at pretest, mobile phone numbers of participants and those important to them (supporters) were taken. Then, on regular daily basis, unique messages were sent automatically to supporters and participants, using existing infrastructures. Height and weight were measured before and after intervention by health care workers that who were blinded to the intervention and control groups. The present study was approved by the ethics committee of the Kerman university of medical sciences. Written informed consents were obtained from all study participants. According to the results, before intervention, women’s mean weight was 63.022 kg in the control group and 67.288 kg in the case group, with a significant difference between the two groups (P < 0.05). However, after intervention, mean weight reduced to 66.388 kg in the case group, but increased to 63.07 kg in the control group (P < 0.001). Before intervention, no significant difference was found in any other demographic characteristics (Table 1). aData are presented as mean ± SD or No. (%). The results showed that before intervention, mean awareness score was 0.8156 in the control group and 0.9611 in the case group, with insignificant difference. However, after intervention, mean awareness score increased to 0.8636 in the control group and to 6.116 in the case group, with significant difference between two groups (P < 0.001). Regarding attitude, before intervention, mean attitude score was 16.65 in the control group and 16.15 in the case group, with an insignificant difference. After intervention, mean attitude score increased to 16.7 in the control group and to 21.1 in the case group, with a significant difference (P < 0.001). Table 2 also shows insignificant differences between the two groups in perceived social, physical, and political supports, and level of physical activity before intervention. But, according to independent t test, after intervention, significant differences were observed between two groups regarding the mean scores of awareness, attitude, and level of physical activity (P < 0.001), with increasing mean scores in the intervention group. With respect to BMI, before intervention, it was 24.353 in the control group and 25.522 in the case group, and the difference was statistically significant (P = 0.028). After intervention, BMI rose to 24.404 in the control group, and according to paired t test, the increase was insignificant (P = 0.664). In the case group, mean BMI reduced to 25.186, and according to paired t test, the reduction was significant (P ≤ 0.001). This study aimed to compare the effect of educational intervention on the level of women’s physical activity using socioecological model. Generally, before intervention, control and intervention groups were similar in terms of demographic characteristics, with the exception of weight. Regarding weight, the case group was slightly heavier before intervention. But, after intervention, the case group weight significantly reduced, while the control group weight slightly increased, which is indicative of positive effect of intervention with this model on weight loss. In their study, Cavallo et al. showed that educational interventions can positively affect weight loss. In a study on weight loss, they used telephone- and internet-based interventions over 12 weeks, which led to weight loss in the group that had received education through internet and mobile phone (17). In the area of physical activity, generally, women who received intervention according to socioecological model showed a significant increase compared to the control group, which is indicative of positive effect of using this model in health education and promotion interventions, especially interventions associated with physical activity and weight loss. Casey et al. used socioecological approach to enhance exercise and physical activity among girls. The results showed that this approach was generally effective in increasing exercise and physical activity in girls. Additionally, interpersonal and organizational supports were also effective in increasing physical activity (18). According to the present study results, after intervention, a significant increase was observed in perceived physical, social and political supports in the case group compared to control. Thus, results indicate that to perform health-based behaviors, development of social, physical, and political supports are essential. Therefore, supporting individuals and appropriate changes to physical and social environment are followed by changes in personal behavior (19). Accordingly, to increase the level of physical activity, in addition to awareness and attitude, other factors such as supports of family and friends, easy access to sports facilities and organizations, and allowing sufficient time for physical activity are also influential (20). Giles-Cort et al. in a study conducted to assess the effects of individual factors, and social and physical environments on the level of physical activity showed that physical environment directly affects the level of physical activity, followed by individual and social factors that increase level of physical activity (21). Among other important results was BMI variations before and after intervention. Although before and after intervention the difference in BMI between the two groups was significant, after intervention, BMI significantly reduced in the case group, and slightly increased in the control. Therefore, in the case group, intervention based on socioecological model increased physical activity and also led to weight loss and improvement in BMI. In conclusion, using innovative and theory-based interventions can be effective in improving health-based behavior. Huberty et al. in their study on feasibility of using interventional approaches to increase physical activity showed that use of interventions based on innovative theories was followed by significant increase in the level of physical activity (22). Limitations in the present study included follow up and access to participants, as well as low speed and narrow internet bandwidth, and sometimes internet disconnection. Despite these limitations and only 6 months of follow up, it seems that interventions based on socioecological model can positively affect physical activity of women and other strata of community. The authors wish to express their gratitude to the management of Kerman university of medical sciences and deputy health, as well as personnel of medical centers. Authors’ Contribution: Design and implementation of the project: Hadi Tehrani; scientific monitoring of the project: Fershteh Majlessi and Davoud Shojaeizadeh; analysis of data: Hadi Tehrani; involvement in implementation of project: Marzieh Hasani Kabootarkhani; participation in writing article: Roya Sadeghi. Funding/Support: This article is the part of a PhD thesis and research project approved and supported by Tehran university of medical sciences.